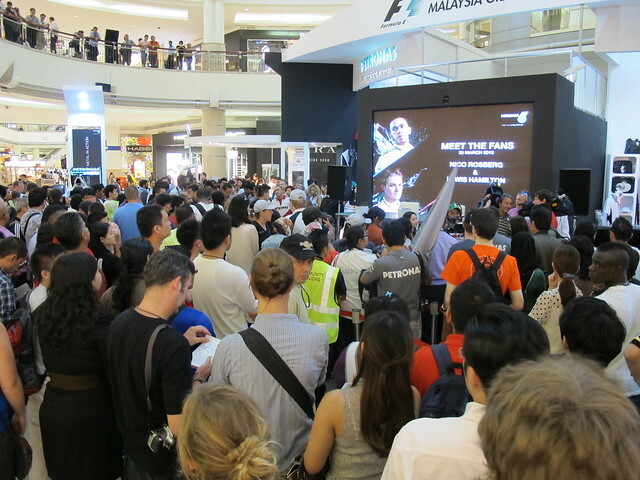 So as any fan would know, this coming weekend is the F1 at Sepang and the Petronas Motorsports drivers were over in KLCC on Wednesday for a meet and greet with the fans. Lewis Hamilton and Nico Rosberg are celebrities in their own right and excellent F1 drivers so the crowd, as expected, was HUGE! 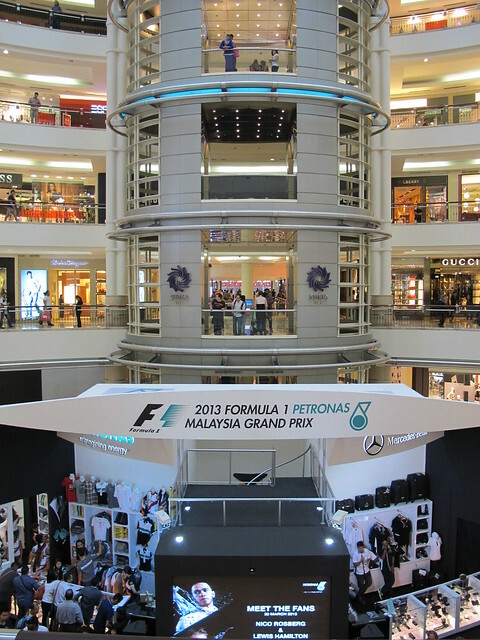 The iconic location of KLCC also adds to the prestige of the event of course, with the proceedings happening in the main concourse. 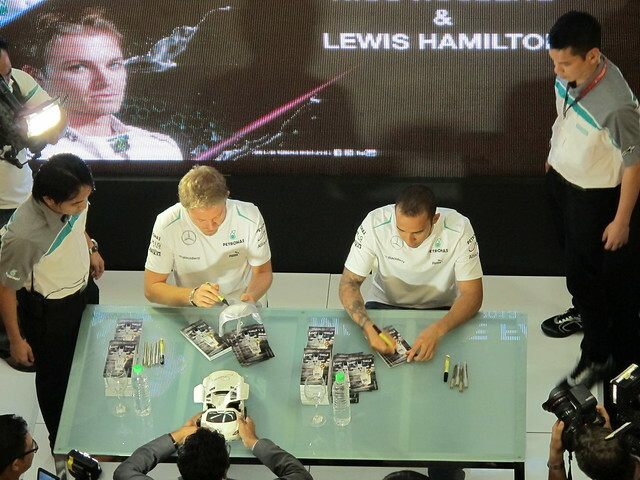 There was a huge crowd lining up to shake hands and get signatures from Lewis & Nico. The crowd went wild when the finally appeared. 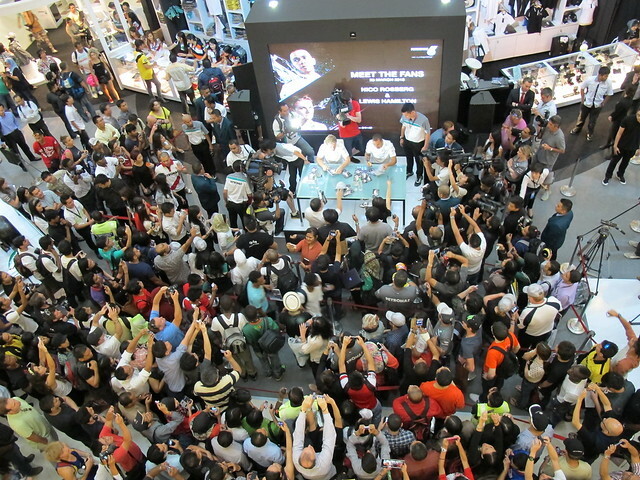 We were able to view everything from the floor above since the KLCC concourse was filled to the brim. They both said a few words to the crowd before heading down to the table to start signing stuff for their fans. The signing table, and the hoardes waiting to shake hands with their idols. 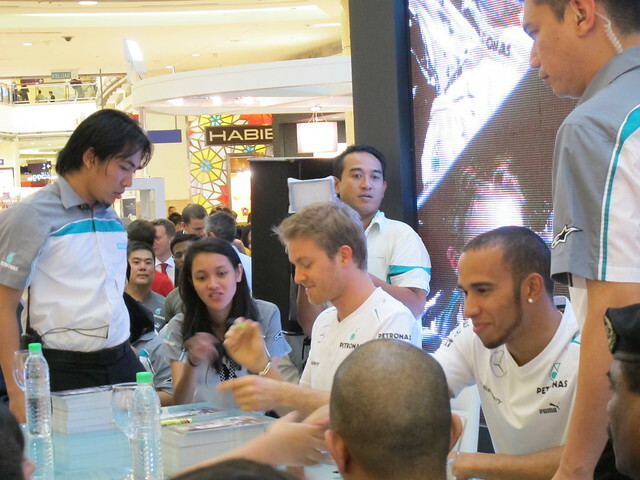 There was a lot of awesome merchandise for sale too from Mercedes and Petronas (booth at the top left). Which was great for the supporters as they could purchase memorabilia on the spot – so many people bought shirts/caps etc for the drivers to sign on. Here’re the boys hard at work. 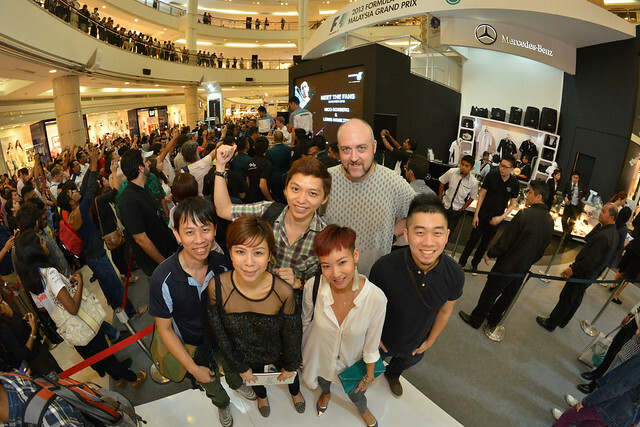 The queue was immense with some people having been their since 10am when the mall opened its doors! There was a boy who even took off his shirt on the spot for them to sign on. Happy fans and happy drivers! F1 really still does have a huge following. Here’s another close up shot of the duo. 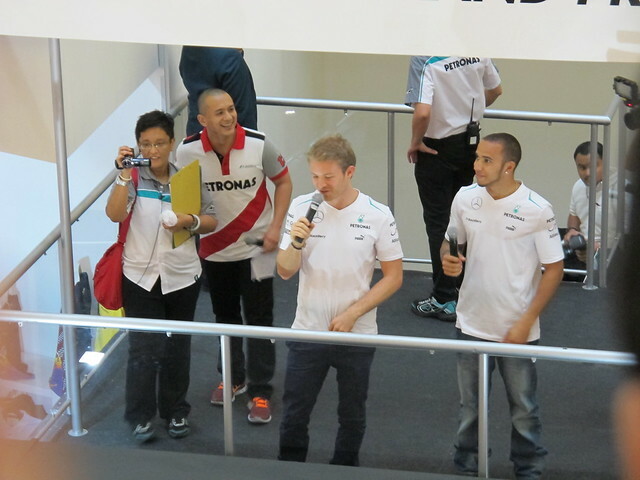 And us who got to meet Lewis and Nico thanks to Petronas and Mercedes. So, anyone going for the Grand Prix at Sepang this weekend? Make sure you get your tickets quickly! Tickets are being sold at KLCC Concourse along with some merchandise. 2008 Malaysian Grand Prix F1 at Sepang – I’ll be there!